NOTICE: Activation key must be used on a valid Steam account, requires internet connection. 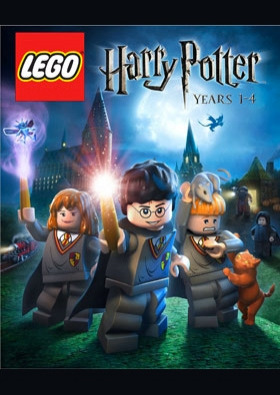 ABOUT THE GAME LEGO® Harry Potter™: Years 1-4 Build the adventure from Privet Drive to the Triwizard Tournament and experience the magic of the first four Harry Potter stories – LEGO style! Explore Hogwarts™ School of Witchcraft and Wizardry, learn spells, brew potions and relive the adventur… es like never before with tongue-in-cheek humor and creative customization that is unique to LEGO videogames! KEY FEATURES Play as Harry, Ron, and Hermione as well as other favourite characters Explore Hogwarts™ castle, Diagon Alley™, the forbidden Forest, the village of Hogsmeade™ and more Cast a spell with a friend and play through the first four stories as a team with Co-op play SYSTEM REQUIREMENTS Minimum OS:	Windows XP / Vista CPU:	Pentium 4 1.8 GHz / Athlon XP 2200+ RAM:	512 MB Video:	ATI X1300 / GeForce FX 5800	256 MB Recommanded CPU:	Core 2 Duo / Athlon 64 2.8 GHz RAM:	2 GB Video:	ATI HD 29200 / GeForce 8800 LEGO HARRY POTTER: YEARS 1-4 software © 2010 TT Games Publishing Ltd. Produced by TT Games under license from the LEGO Group. LEGO, the LEGO logo, the Brick and the Knob configurations and the Minifigure are trademarks of the LEGO Group. Windows and the Windows Vista Start button are trademarks of the Microsoft group of companies, and 'Games for Windows' and the Windows Vista Start button logo are used under license from Microsoft. All other trademarks and copyrights are the property of their respective owners. All rights reserved. HARRY POTTER characters, names and related indicia are trademarks of and © Warner Bros. Entertainment Inc. Harry Potter Publishing Rights © JKR. WB GAMES LOGO, WB SHIELD: ™ & © Warner Bros. Entertainment Inc.